Daily Illuminator: Munchkin Collectible Card Game Prerelease Events This Weekend! January 23, 2018: Munchkin Collectible Card Game Prerelease Events This Weekend! The team here at SJ Games is ready to head across the country, helping some awesome game stores host Munchkin Collectible Card Game prerelease events! 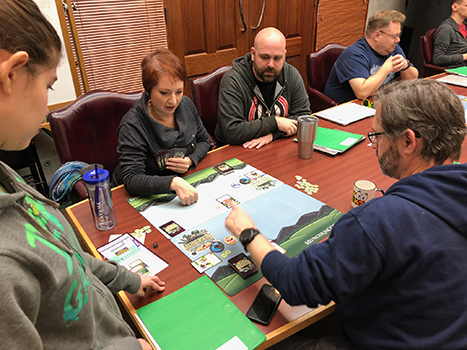 These learn-to-play events will take place this weekend, January 25-28, and will give gamers the first opportunity to play the game outside of our convention demos. Not only that, but participants will get to keep their deck to take home! This is the perfect event for players wanting to try the game out for the first time, since everyone is experiencing the Munchkin CCG for the first time. But make sure you sign up soon; spots are limited and events are filling up fast! You can find a full list of events, with dates, in this Daily Illuminator article (see your store for details). 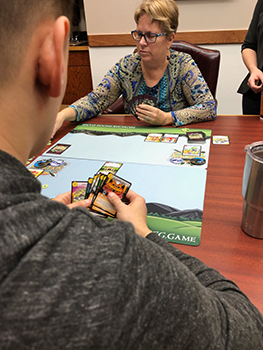 If you want to get the upper hand before heading to an event, check MunchkinCCG.game for our strategy articles and to find out about the different heroes you can play, as well as some of the tips and tricks to playing them! We've also been opening some Munchkin CCG boosters over on Facebook! Watch me crack some booster packs, and get a sneak peek at the variety of cards that you may find when the game releases in February. Even if you don't have a prerelease near you, preorders are still available at your favorite local game store. Simply print a preorder form, fill out what you want, and give it to your store. Preorders help your store know there is interest, and hopefully support the game with organized play. If you're a retailer, you can email us for more information about our organized-play kits as well! Come out and play the Munchkin CCG with us this weekend!